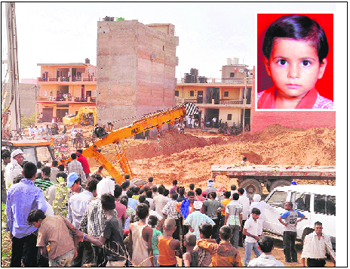 Pushing away a boulder covering a borewell opening proved costly for the family of Maahi, a 4-year-old girl, who accidentally fell into a 60-feet deep borewell near her house in Kho village near here late last night. Standing crops on hundreds of acres of agriculture land were submerged under water due to a breach - third in the past one month - in the Munshiwala Minor near Shehnal and Hamzapur villages here today. The Trinmool Congress (TMC) of Mamta Banerjee, which launched its north zone chapter here only seven days ago, received a big jolt today when Dalip Chawla, popularly known as Bittu Chawla, quit the party. The cold-blooded murder of a widow in Karnal yesterday and failure of the police to arrest the accused made Raipur villagers squat on the road with the body and block the national highway (GT road). A 32-year-old widow, Mukesh, was allegedly murdered in her in-laws’ house yesterday and the police registered a case against nine persons but no arrest was made. The police here has arrested the father and the grandfather of a seven- year-old girl who was unintentionally killed by them under the influence of liquor during a feud. The deceased was cremated secretly and her mother was threatened of dire consequences if she spoke to anyone about the incident. Chaudhary Devi Lal University, Sirsa, has revived “Chaudhary Dalbir Singh Chair” founded after Union Minister for Housing and Urban Poverty Alleviation Kumari Selja’s father. The Vice-Chancellor, Dr KC Bhardwaj, today appointed Dr Anu Shukla, former chairperson of the English Department as Professor in the Chair. Acting upon a report in The Tribune, J Ganesan, Deputy Commissioner, Sirsa, has ordered an inquiry into the funds spent on flood-protection work to save people from the fury of Ghaggar. Satish Kumar, a junior commissioned officer (JCO) and a resident of Baghanki village in Gurgaon district, has requested President Pratibha Patil to allow him to end his life. In a letter to the President, the JCO has sought permission for euthanasia as he was unable to bear the biased approach of the Gurgaon police. Within a week of returning home after spending around nine years in jail on charges of murdering his elder brother, a middle-aged person hacked his mother to death with a sharp-edged weapon in a Sampla block village in the district on Wednesday. The accused, who has been arrested, was reportedly upset with the lack of care and concern on the part of his mother during his jail term. He committed the crime after a verbal duel with her yesterday. The Haryana Government has enhanced the penal and market rent of government accommodation with a view to checking unauthorised retention. An official spokesman said here today that normally, government employees did not vacate official accommodation on the prescribed date after their retirement or transfer. Further, some of them earned rental income from their own houses. Agitated over the irregular drinking water supply for the past six days, residents of Mohalla Kalan here blocked traffic at Geeta Bhawan Chowk around 9 pm yesterday. Empty water pitches were thrown on the road to express their resentment. Neighbours said it was Maahi’s birthday yesterday and her family had organised a big celebration last evening. As the tempo, reportedly carrying the DJ system, could not pass beside the borewell, the boulder covering the borewell opening was reportedly pushed aside to make way for it. However, a little later, Maahi, who was playing with other children, slipped and fell into the borewell. Rescue operations began last night itself, but it gathered momentum with senior government officials reaching the scene of the accident in the morning. JCB machines were used to dig a tunnel parallel to the borewell. The digging of the tunnel was expedited after a drill equipment used by the DMRC was installed for the purpose in the evening. personnel, fire and health officials, policemen and Delhi Metro Rail Corporation (DMRC) functionaries were engaged in the rescue operation. A parallel pit was being dug to reach the girl and bring her out safely. Oxygen was being supplied to the girl and her movements were being tracked with the help of cameras. A number of people gathered around the spot despite hot weather. Maahi’s father, Neeraj Upadhyay, a migrant labourer who works as a security guard with a private company, said they had celebrated the girl’s birthday yesterday. “In fact, the celebration was on and Maahi was playing in front of our house when she slipped and fell into the borewell around 11 pm. We called up the police immediately,” he said. Neeraj maintained that Maahi kept on crying for help from inside the borewell for more than an hour. The hapless parents and other family members kept on calling the girl even after she stopped responding. The family saw a ray of hope when the officials maintained that some movement inside the tunnel had been recorded on the camera. However, after that, the long, agonising wait resumed. Gurgaon Deputy Commissioner PC Meena has ordered a magisterial probe into the matter involving the falling of a girl in an open borewell. The inquiry has been assigned to the Gurgaon ADC, KM Pandurang. An FIR under Sections 188 and 336 of the IPC has been lodged against the house owner, Rohtash Tayal, a resident of Delhi, for digging the borewell without obtaining the requisite permission. A case of contempt of court will also be pursued against him. 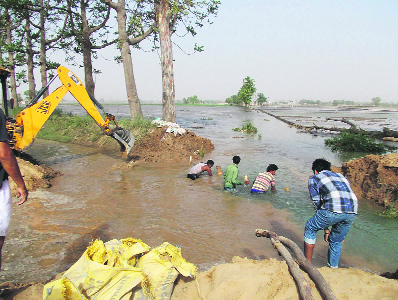 Officials of the Irrigation Department have been trying to plug the breach with JCB machines. “This is the third time in less than a month that this canal has suffered a breach. The Irrigation Department has not cleaned the canal of silt and vegetation resulting in narrowing of the creek. Water overflowed due to silt and vegetation before a bank of the canal finally gave way,” alleged villagers, who had assembled at the site. The villagers alleged that they have been suffering losses due to repeated inundation of their fields, but the authorities have not been paying heed to their problem. Satish Kumar Jinaawa, Executive Engineer of the Irrigation Department, however, maintained that the breaches were occurring repeatedly due to the quality of soil of the banks, which developed cracks in hot conditions. He said when water suddenly flowed in the canal, its banks gave way. “One solution is to leave smaller quantities of water initially to allow rinsing of the canal before it runs to its full capacity, but in that condition, farmers, whose turn comes first do not allow us to do that,” Jinaawa maintained. Jinaawa claimed the department acted swiftly in plugging the breach in Fatehabad branch that developed a breach on Monday and plugged it in less than 20 hours. Meanwhile, a 30-foot wide breach developed in another canal - Bhirdana Minor - near Hasanga village leading to inundation of crops on over 50 acres of land. Chawla was appointed convener of the Haryana unit of the party by industrial tycoon KD Singh, who has been made in charge of the north zone chapter of the party, on June 14 at the inaugural function presided over by Union Railway Minister Mukul Roy. Roy is also a general secretary of the TMC. Along with Chawla, Shashi Malhotra, who had conducted the stage at the inaugural function, has also quit the TMC. Chawla, who is a former media coordinator of Haryana Chief Minister Bhupinder Singh Hooda, told The Tribune on the phone that certain persons misled him to join the TMC. He said he took this step without consulting his advisers and well-wishers. He said now he had realised his folly and had come back to his home, the Congress. Only yesterday media adviser to Haryana Chief Minister Sunder Pal had quit his post, which he had been holding for more than seven years. Speculation is that he may join the TMC. Chawla’s home coming is a big setback to political ambitions of the Chandigarh-based industrial tycoon, who is also a Rajya Sabha member. The cold-blooded murder of a widow in Karnal yesterday and failure of the police to arrest the accused made Raipur villagers squat on the road with the body and block the national highway (GT road). A 32-year-old widow, Mukesh, was allegedly murdered in her in-laws’ house yesterday and the police registered a case against nine persons but no arrest was made. Furious over police inaction, people from the native Raipur village of the deceased placed her body on the national highway and blocked traffic. The blockade was lifted after the district police chief assured villagers that prompt action would be taken to arrest the culprits and the villagers gave 24 hours’ ultimatum for arresting the accused. 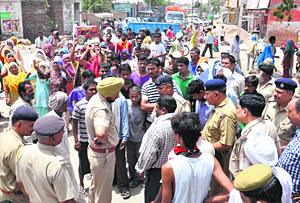 In another murder case in which Ashok Kumar, a resident of Samalakha village, who was brutally stabbed to death at the busy Hansi road in broad daylight in the presence of a large number of people on May 29, the enraged relatives and near and dear ones of deceased blocked the Hansi road for almost two hours, protesting against “inaction” of the police in the murder case. Not even a single person had been arrested during the past three weeks and the people were up in arms against the police for alleged laxity and were demanding that the guilty should be punished and justice should be done, said Shashi, sister of the deceased. The deceased Ashok had a dispute with some persons in the village and he was to appear in the court a day after he was murdered and the family members suspected the hand of the rival party in his killing. However, the victim’s mother, not caring for her safety, informed the police following which the police arrested both the father and the son. Both the accused were produced in a local court and sent in judicial custody. Giving details of the case, Kuldip Singh, SP, told mediapersons here today that Pooja, wife of Ramdiya, a resident of Teek village of the district, in her complaint to the police said that she had three children, Aman (10), Raman (7) and Rahul (3). Her husband often used to beat her after consuming liquor. On May 10, her husband and father-in-law sat together for drinks at about 8 pm and soon started quarrelling among themselves. In a fit of anger, her father-in-law picked up an axe lying nearby and threw it at her husband. The axe missed Ramdiya and hit her daughter on the face, following which she died on the spot. The university had set up a chair in the name of Chaudhary Dalbir Singh, himself a former Union Minister and six-time MP from Sirsa, in 2006. However, nothing concrete was done in this direction after that“Chaudhary Dalbir Singh Chair will work towards facilitating studies for promoting communal harmony, providing justice to weaker sections of society, strengthening the national mainstream, facilitating capacity- building, women empowerment, fighting social evils, dowry, child marriage, female foeticide and domestic violence,” Dr Bhardwaj said after the appointment. Once politically close for years, Chief Minister Bhupinder Singh Hooda and Kumari Selja have not been enjoying the best of relations of late. In the backdrop of this, the revival of “Chaudhary Dalbir Singh Chair”, which was lying defunct for six years is being seen as a significant development. In a report, “Flood preparedness report raps authorities” published in these columns on June 19, The Tribune had quoted an executive engineer of the Irrigation Department that Rs 5.63 crore had been spent on flood-protection work under MNREGA since 2010. The news item pertained to a report prepared by the District Congress Committee that nothing had been done to protect people from floods in the Ghaggar since 2010, when thousands of acres of land was inundated. DCC president Malkiat Singh Khosa, who authored the report based on a survey conducted by his workers and village sarpanches, met the DC and expressed apprehension that funds might have been siphoned off by unscrupulous officials as nothing has been done on the ground. Satish, currently posted at an artillery regiment in Hyderabad, has stated that due to his service he had been away from his native village for the past 15 years. He, along with his wife and two children, had been living at the stations where he got posted. Early this year, Satish asked for his share in his ancestral property at the village as he wanted to build a house there. However, he found that his cousins had grabbed his plot. The soldier said he lodged a complaint at the IMT Manesar police station, but the police did not take any action. Satish went to his village with his family last month. Where he and his family members were attacked by his cousins. The police lodged complaints from both sides. “However, while my brothers were arrested and sent to jail, none from the other side was even taken into custody,” said Satish. In his complaint, the JCO said his father was also in the Army and had died during service. His widowed mother and younger brother were helpless against his powerful cousins and their family. Instead of taking action against them, the police had targeted his family. The latest incident of murder took place at Bakheta village, about 20 km from here, when the accused, identified as Satya Prakash (38), attacked his mother, Sona Devi (62), with a spade after a heated argument. The victim was engaged in some repair work in the house when she was attacked with the spade, it is reported. The accused reportedly told the police that he was upset as his mother failed to visit him even once during the jail term. Satya Parkash was released from the jail about a year in advance due to his good behaviour. But his conduct after release from the jail was shocking, said a police official. The accused was produced in the local court today. He said it had been decided that the penal rent would at least be 300 times the licence fee. He said the penal rent could be charged after three months of overstay. The defaulting employees would be charged twice the market rent. It might be revised on an yearly basis. In the case of sub-letting , the penal rent would be 500 times the licence fee for the first three months and five times the market rent thereafter. Also, it should debar him or her from getting government accommodation for five years. Irked villagers from Bajekan laid a siege to the Shahpur Begu powerhouse on Barnala road for a few hours today. The villagers alleged that they had been getting power for merely one to two hours daily but repeated complaints had failed to move the authorities. Due to erratic power, drinking water had also become scarce in their village.